All our good wishes for a Merry Christmas & a Happy, HEALTHY New Year!!! 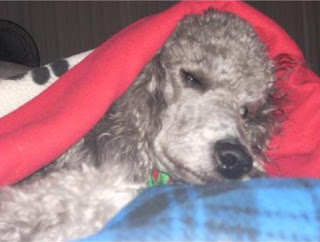 These wishes are brought to you from my friend Jeanne Haight, her Poodles Katie and Morgen and... Himself!! Himself is the Santa behind the scene who supports all these lovely girls. Thanks Jeanne, for best wishes to all readers of the Poodle Blog! ps to Himself....these girls are expecting a BIG bag of toys this year! All is not what it seems! Doesn't my friend's dog Morgen have an elegant, almost regal expression in this photo? There is a story behind this picture Mellie. It is my favorite photo of Morgen but I laugh when everyone who sees it mentions how elegant and ladylike she looks. To get this photo, I had to lay on my belly in the grass. Now, for a 75 year old lady, that is no mean feat! It is not the laying down that gets you, it is the getting back UP! Morgen was only about a year old in this picture but she had already graduated from Basic and Advanced Obedience classes. Morgen even earned her Canine Good Citizens certificate, so she was well versed in knowing what I meant when I was saying "Morgen, watch me...watch me Morgen...Morgen...Morgen!" She was totally ignoring me and that regal look was actually Morgen's "I don't feel like watching you" expression!! Amy, what is the primary product offered by K9 Collage and how is it different from just taking a few photos and putting them together in a frame and calling it a collage? 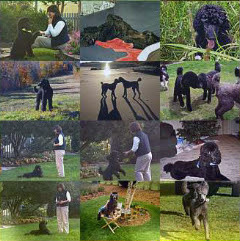 K9 Collage offers a unique way to display a large amount of pictures in one setting. What we create is called a photo mosaic, and is a collection of photos arranged in a way that when viewed from a distance they resemble an overall picture. It differs from the traditional collage of where you might only have a few photos arranged on a page. Our photo mosiacs look like one photo from a distance, yet as you approach it you see that it is made up of hundreds of photos. Could you explain to our readers a bit more? Yes, a photo mosaic focuses on one main picture (the main background image) which is made up of lots of little pictures (the tile photos). The tile photos can be any photos you choose. So as an example, you would pick your main image; the picture you sent me of you and your poodle Lizzie. This is now set as the main background image. Then you would upload anywhere from 36 to 500 tile photos of your choosing. Most customers upload anywhere from 50 to 75 photos. Do most people send photos of the same dog? I know I used various Poodle photos. No, the tile photos can be anything, but most likely you would pick photos that go along with your main image in some way. once you have completed uploading all of your tile photos you simply submit your mosaic for processing, and we take over from there. This seems like a really unique thing to do to preserve the memory of a special pet, or as a special gift for a friend. Yes, it is a beautiful way to preserve a memory. 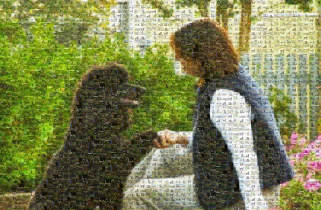 A photo mosaic makes a unique and personalized statement and can be used in a variety of ways to mark an occasion such as capturing your dog's final Championship points in conformation, an awesome agility run or a day at the beach. Photo mosaics are nice for capturing everyday moments too. They make a great impression and are a fun conversation piece. So will I be able to see all the photos in the finished product? Yes, that's the beauty of this, when you look up close you will see all the tile photos you submitted stitched together. When you take a few steps back you will see the one image that you chose as your main background image. As an example I've attached a small area of the mosaic we created for you. This is what you would see when looking at the mosaic up close. Although your mosaic is made up of almost 3,000 tiles it was created using only the 47 unique photos you sent us. They are duplicated in different areas on the main background image in order to fill in the whole picture. I actually found the process very simple and easy, does everyone feel this way? YES! After you register with us, it is as easy as uploading your photos and clicking submit. What sizes are the finished prints and could you give me an idea about price ranges? There is NO CHARGE to create a mosaic. After the mosaic has been created you have the option to purchase prints, canvases and other merchandise from our store. prints start at $24.99 for an 8 x 10, however our most popular size is the 16 x 20, which runs $49.99 and is a good size for viewing all the individual tile photos that make up the mosaic. We also offer gift certificates starting at $25.00. 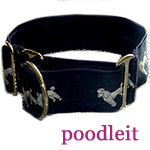 We hope you'll visit us at http://www.k9collage.com/ try it out. Right now we are offering a holiday discount. Enter coupon code HOLIDAY10 to receive 10% off your purchase of prints, canvases and other merchandise. Thank you so much Amy. 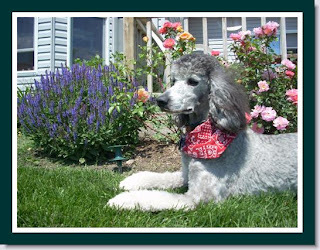 I would also like to thank Chris L'Abbe and Rick Miles, both of whom shared some of their beautiful Poodle photography with me for use in this memory mosaic of our sweet Lizzie (Wildgayle's Elizabeth). Thanks Melanie for this opportunity to share K9 Collage with your readers. 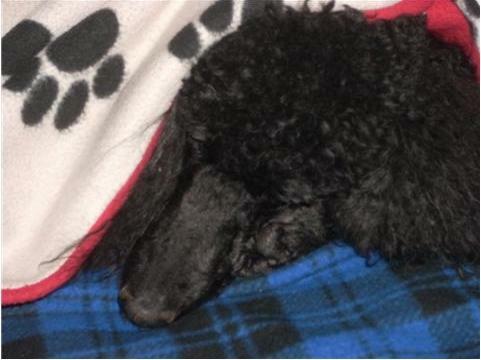 Who says Poodles are not a working breed? 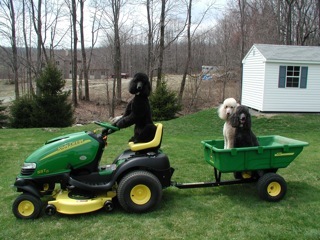 These three are obviously busy keeping up with the landscaping in the Trebert's yard! Seriously, Poodles excel at all types of dog sports, including but not limited to obedience, rally, tracking, agility and hunting. Keep in mind that they were originally developed to be water retrievers, so a Poodle jumping into the water to retrieve a duck is actually work they were bred to do. Many Standard Poodles love to do any kind of work their owner wants them to do...including posing for photos like this one, or even acting in the movies. Some of the most amazing work I've ever seen Poodles do involves being trained for behaviors that are put together for Poodle movies. You can read about this, see movie star Poodles owned by Charlene and Glenn Dunlap and read about their film work, even see clips of them performing, on Charlene's website at www.caninehorizons.com. Many thanks to Donna Trebert for sharing this wonderful tractor photo with us!